Location: River Bewl, Kent, England. Ownership / Access: National Trust, Open to public. Notes: Scotney Castle is an English country house with formal gardens south-east of Lamberhurst in the valley of the River Bewl in Kent, England. It belongs to the National Trust. The gardens, which are a celebrated example of the Picturesque style, are open to the public. The central feature is the ruins of a medieval, moated manor house, Scotney Old Castle, which is on an island on a small lake. The lake is surrounded by sloping, wooded gardens with fine collections of rhododendrons, azaleas and kalmia for spring colour, summer wisteria and roses, and spectacular autumn colour. At the top of the garden stands a house which was built to replace the Old Castle between 1835 and 1843. 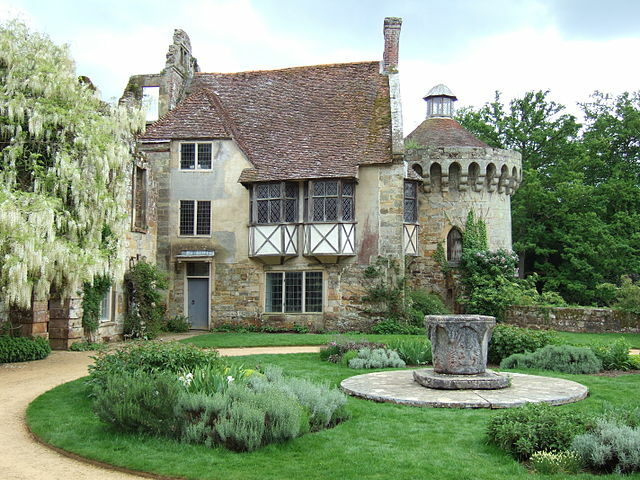 This is known as Scotney New Castle, or simply Scotney Castle, and was designed by Anthony Salvin. It is an early, and unusually restrained, example of Tudor Revival architectural style in 19th century Britain. Following the death of the resident, Elizabeth Hussey, in 2006, this house was opened to the public for the first time on June 6, 2007.